I have been transcribing (with help from friends) some handwritten poems by my grandfather, that my mother found. It is rather wonderful to have glimpses, through his poetry, of his inner world. His name was Ernest Singer. He died before I was born and came to the UK from the Czech Republic. As a medical doctor, he was set to work after the war running a hospital in Germany. These are his words, in a poem titled Germany 1946. I can feel as if there, taken back, with him. A scene of utter desolation. A mass of rubble in fantastic line. Carpets the ruins with sprouting weed. 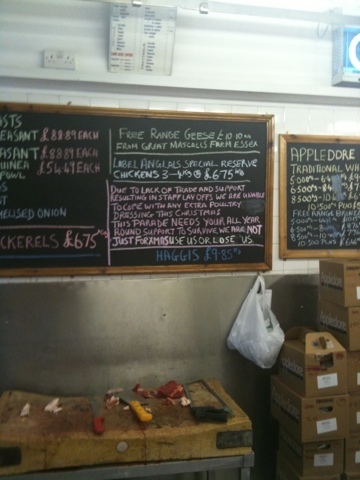 Picking up fare for the non-vegetarians at our local and organic butcher with thi sign, true for all independent local shops – use us or lose us. Government is stepping up plans to give its employees a right to run their own services as mutuals and the idea is that staff will be happier owning and running their own service. To test this, I have compiled data on staff engagement in the current models across Whitehall and wider government agencies. For the first time, we have apples and no pears, as the previous Government sensibly started to run a single survey across staff. But some of the apples were kept unpublished so we submitted some simple freedom of information requests to dig these up. The Staff Engagement League Table, to give it a posh name names Her Majesty’s Revenue and Customs (HMRC) as the worst place to work across government, followed by the Ministry of Justice. Those nice people at the Department for Education come top. The basis for the data is the 2009 People’s Survey, which tracked 340,000 civil servants across 96 organisations of government. Most of the data is open, but some departments, including HMRC, the lowest scorer, and the Department of Business, Innovation and Skills (BIS), which has published material encouraging businesses to promote employee engagement, failed to publish their overall engagement scores. The survey is in the process of being repeated, and in the context of cuts, it is not clear that the overall results will be any better. The point isn’t that if you become a co-op, everything is rosey. The point is that what matters is having a co-operative culture – top-down Whitehall has rarely been good at that, with some honourable exceptions, often among the arms-length agencies. Engagement is a good test of how people feel about their job. All work tends at best is a two-way, co-operative process, based on mutual obligations that go way beyond a formal contract. Non-native nuts include Brazil nuts (surprise, surprise) and Walnuts – the word ‘wal’ in fact comes from an old English word meaning ‘from strange lands’. All happy cracking for Christmas. According to the language in early documents of the Co-operative Union, my role includes the dissemination of propaganda in favour of peace and justice. So, I’ve enjoyed reading “The People’s Cinema” which Shelagh passed me, about the use of film by the co-operative movement from as early as 1898. Gracie Fields starred in two short movies – one, looking at a still photo, with an outsized co-operatively farmed Scottish salmon. My favourite title so far is “The Penny: what can be done with it”. When I was six, moving to a new house and with the find of a toy truck, I remember being told that it is good to share. It’s a message that we are careful to encourage with young people but rather careless when it comes to adults. Despite the many benefits of fairness, we are a unequal society. Look at who owns the land around us. Look at the roads long with single car drivers. Look at the rising number of homes with single occupants. Look at our houses packed with products for private use, from dishwashers to lawn mowers – all opportunities for consumption that would keep a village in Africa going for a year. Co-operatives are a way of sharing. The number one association of the public when it comes to what co-ops do is that we share our profits (79%). The fortnight represents a celebration of cooperative action. In 2010, our first year, 2.3 million people got involved up and down the country. The dates are June 25 – July 9th 2011 and we welcome your ideas and suggestions for action, fun, celebration and protest around the urgent call for a people-centred economy – a revolution that widens ownership and promotes sharing.